Crowd funding is a fantastic idea. Kickstarter, GoFundMe, Razoo and a bunch of other sites allow a unique funding method where common people like you and me, henceforth the crowd, fund personal or business projects for aspiring entrepreneurs and artists. Crowd funding gives folks the feeling of personal involvement with a project, and it’s a perfect venue for starting a brewery as well. Just ask San Diego’s Modern Times Beer project. The brewery, and its owner Jacob McKean, are in the midst of a hugely ambitious Kickstarter campaign, which ends this Friday, aimed at funding a tasting room, lab and barrel aging facility (among other things) at the new brewhouse. Fortunately, backers have risen to the challenge in a super-sized way and helped Modern Times Beer blow past its goal of $40,000 (up to $58,000 and change last time we checked). According to the Modern Times Beer blog, if the group hit $52,375, they would be the biggest-backed brewery ever on Kickstarter. They did hit the goal, so some of their big vendors are donating even more money to a charity, which is pretty cool. 1. Premier Stainless Systems ($600). These guys are the super experienced Escondido-based savs who built our brewhouse & fermenters. 2. Atlas Kegs ($500). These guys came up with this whole “break the record/give to charity” idea, which lets you know how super cool they are. 3. Coastal Automation Solutions ($500). Our insanely skilled contractor, they built the new Green Flash, Societe, Stone Liberty Station, and our place. 4. The Country Malt Group ($200). Known to every homebrewer the world over, they’ve been supplying grain to breweries for a long, long time. 5. Helms Workshop ($200). The geniuses behind our mind-blowingly awesome can designs and some of the best graphic designers working today. 6. Brewers Supply Group ($200). Famously excellent suppliers of malt, hops, and a smorgasbord of other necessities for the craft brewer. 7. Beer-Con ($200). 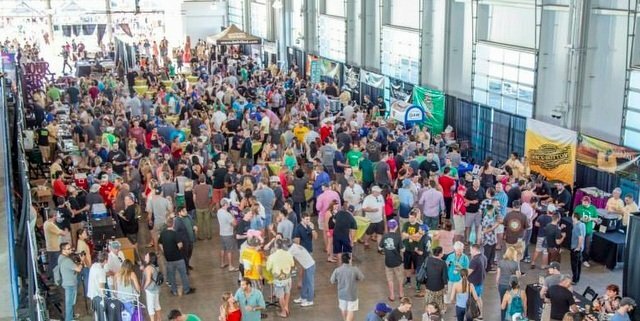 This unique local beer conference is in its 3rd year. We’re planning on being a stop on their popular brewery tour circuit. Wanna add your name to that list? It’s not too late. Shoot the soon-to-be brewery an email through its contact page. If you can’t throw in any cash, try spreading the word on Facebook and Twitter. To learn more, watch the hilarious video above.